A six city tour of General Macbeth: Castle Pon the Sand opens August 21, 2010 at the Toronto Centre For The Arts. Additional performances will be held in Ottawa, Hamilton, Etobicoke, Mississauga and Scarborough as part of the I Love The Caribbean Movement. The Scotiabank Toronto Caribbean Carnival is an exciting three-week cultural explosion of Caribbean music, cuisine, revelry as well as visual and performing arts. The festival takes place at various locations in Toronto engaging many sectors of our city and citizens. Pre-festival activities include the Calypso Tents Music Series featuring The Professionals, Kaiso Forum, De Masters Cove from June 10 to July 10, at various venues across the GTA. This year`s festival features a NEW event – a sporting event in partnership with the Canada Rugby League. Caribbeans are amongst the most creative and entrepreneurial people on the planet. 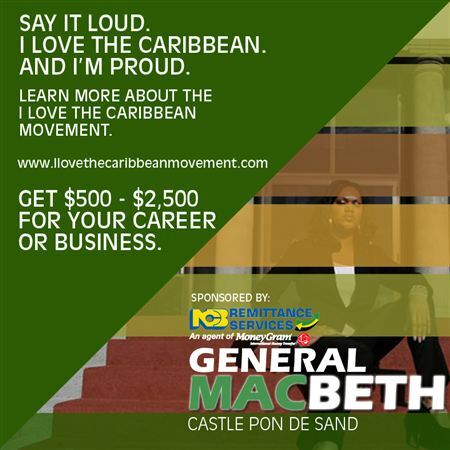 Rinkah Entertainment the producers of General Macbeth: Castle Pon De Sand launches an innovative awareness initiative to recognize them.